At the most basic level, a flag is a symbol. It represents some other concept, and it's understood that the purpose of a flag's existence is to induce thoughts of that other concept. But flags don't simply exist. They are raised. They are waved. They are unfurled. They are shown. Sometimes assertively, and other times, quietly. But the display of a flag is always a conscious decision at some level. 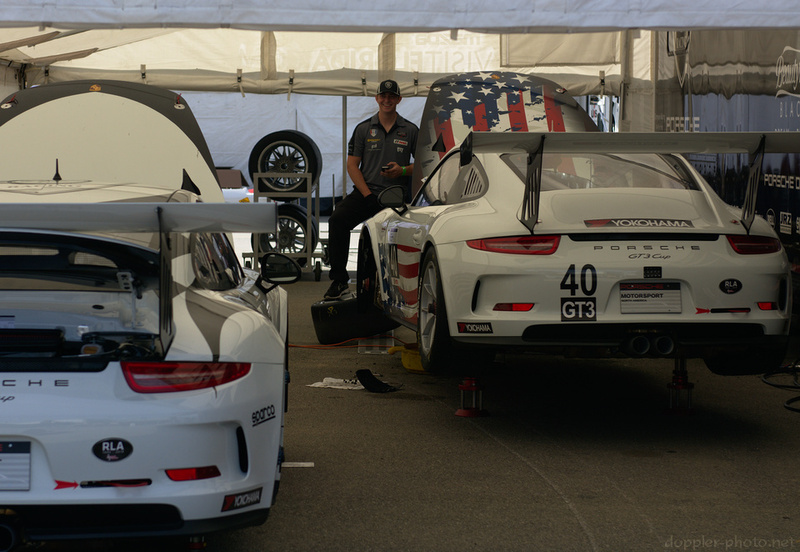 Flags in motorsports are ubiquitous. The car control flags are most obvious — green means "go! ", red means "stop," yellow means "proceed with caution." But there are plenty of others. The car control flags are most frequently perceived as commands, but they become more personal when shown out-of-context. Moreover, as mentioned above, the display of a flag is always active, and in many cases can be a proclamation of pride. 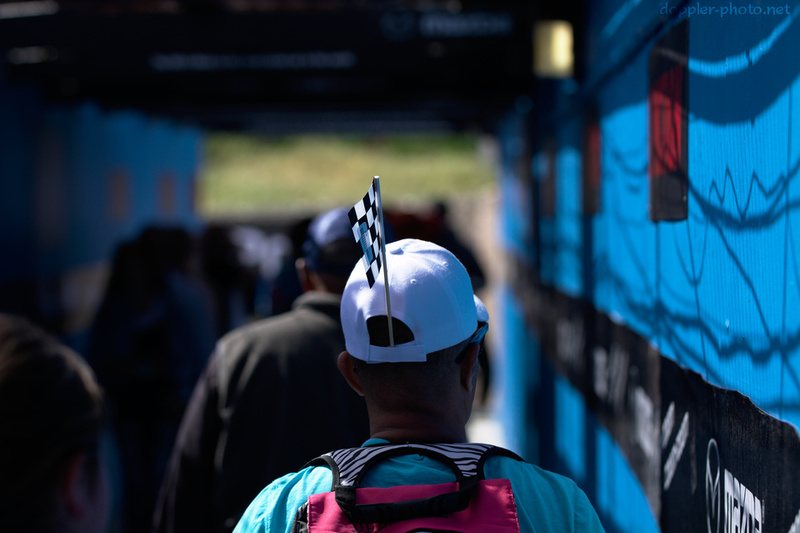 A tiny checkered flag like this might indicate "I'm proud to be a racing fan." 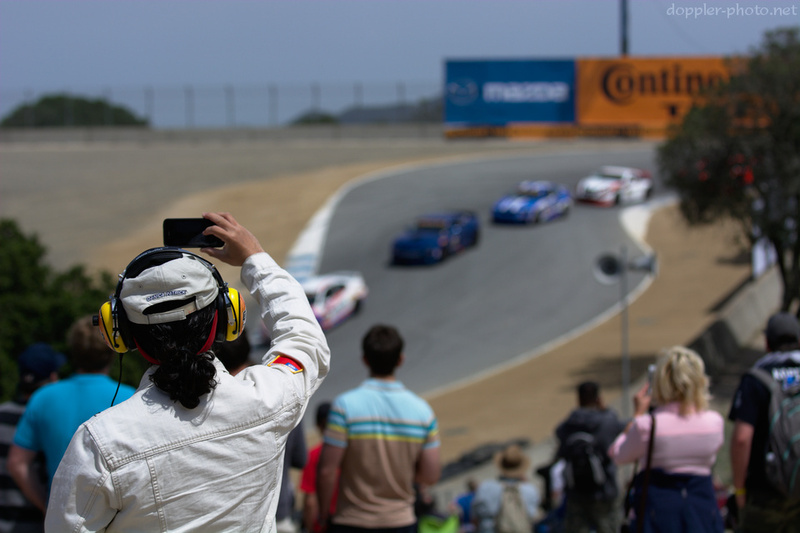 A legitimate checkered flag laying on a car, or being held aloft by a car driver, typically proclaims that they won the race. For instance, check out "Continuity" from the 25 Hours of Camaraderie series. 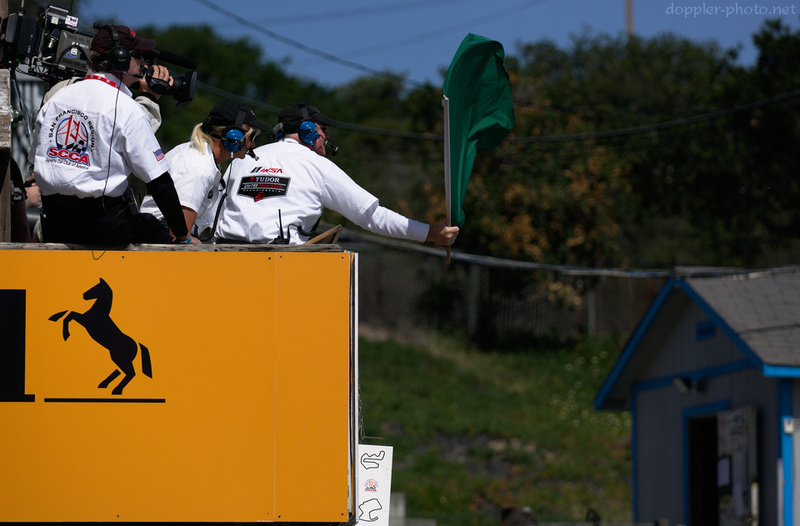 Flags that are incorporated into car liveries are often also proclamations. "I am proud to represent my country." (The "Rebirth from Fire" post shows another example.) But again, it's the conspicuous display of a flag where one might not be expected that makes the proclamation so emphatic. Of course, the distinction may be subtle between an in-context and out-of-context (or expected and unexpected) display of a flag. The Taiwanese flag on this person's shoulder is ambiguous for me. Is it a standard part of a uniform? Or did the person affix it of their own volition? In the latter case, it's a definite expression of self, and in the former case, it may or may not be. Some cases are mixed. 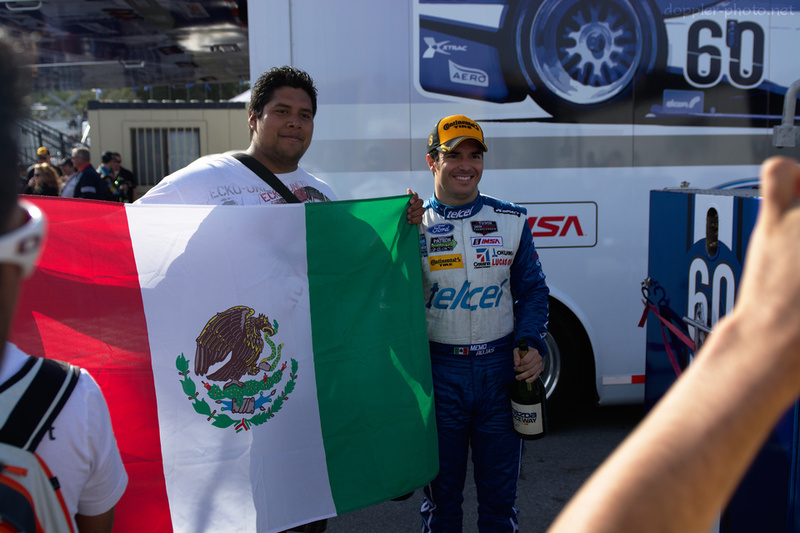 The display of a country-of-origin flag next to a driver's name is a standard. But the side-by-side display of the American and Japanese flags is not. 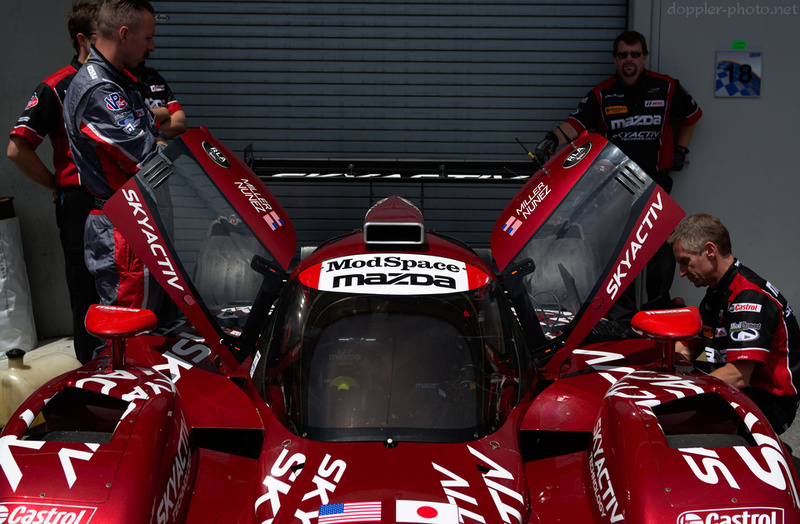 Instead, I'm confident that's meant to convey the partnership between Mazda (a Japanese company) and SpeedSource Race Engineering (an American company) in the development of the Skyactiv LMP2 cars for competition in this particular race series. Some associations aren't with a country at all. 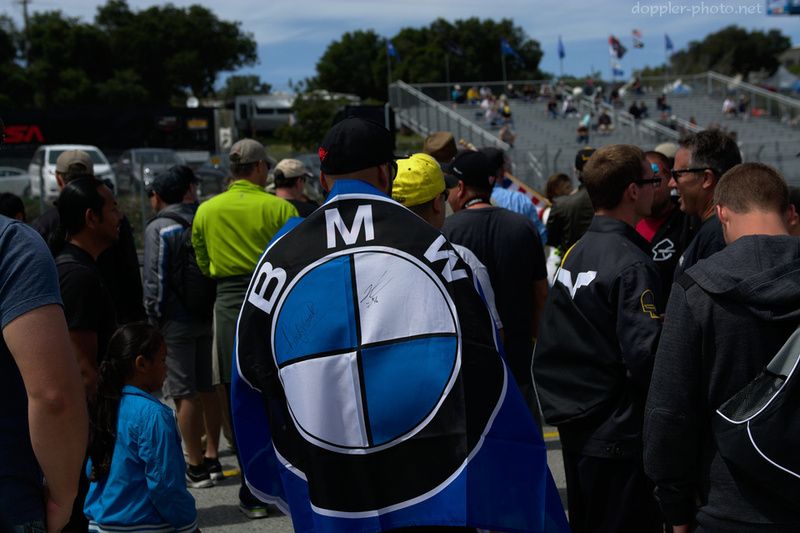 I spotted this BMW fan during the grid walk, where, after the cars are parked on the starting grid, spectators can enter the hot pits to see the cars and meet the teams that run them. The flag features signatures from BMW RLL drivers Andy Priaulx (who drove the #55 BMW Z4 GTE) and Joey Hand (who drove the #56). And again. 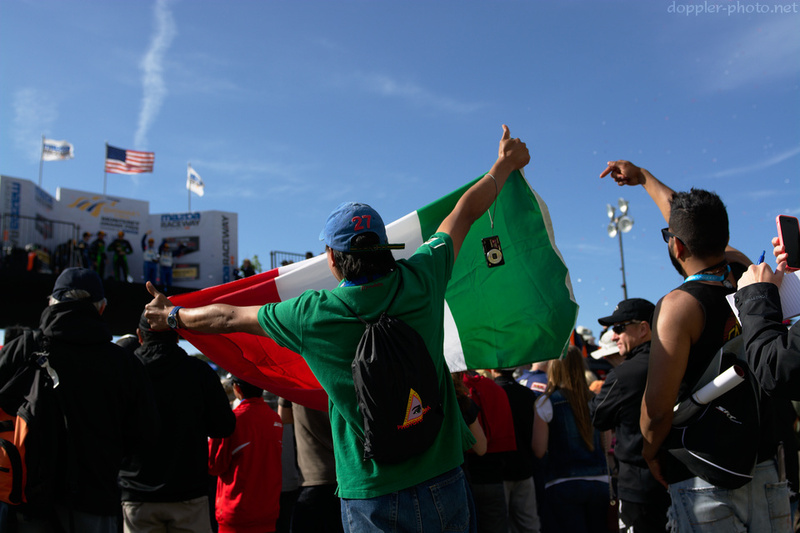 These fans broke out their national flag to cheer on Mexican driver Memo Rojas, who placed third alongside Scott Pruett in the #01 Ford EcoBoost/Riley car, campaigned by Chip Ganassi Racing. "Orgullo," the title of this post, is the Spanish word for "pride." And it felt fitting, since seeing the fans cheer for Memo Rojas was one of the most memorable aspects of the weekend, for me. In this case, the flag and it's various associations served to not only connect fans and driver with their shared mother country, but also with each other. The BMW logo is based on the flag of Bavaria. So the BMW flag does have a geographic association.